Just pay $5.95 rush processing and shipping. Offer limited to one per household. This offer only available in the continental USA, Alaska, Hawaii, Guam and Puerto Rico. 100% RISK FREE GUARANTEE. Your Satisfaction Guaranteed or Your Money Back. 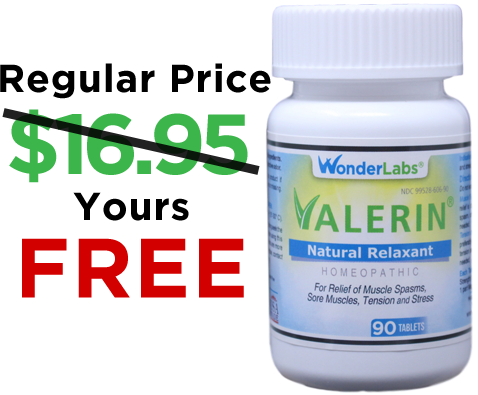 Valerian calms the body and mind for a feeling of well-being. It works naturally to also bring relaxation to sore, stiff, knotted muscles that can put you on the sidelines of life. Unlike prescription drugs, there's NO grogginess or morning hangover feeling with this soothing herb. Passiflora has been called nature's tranquilizer, because it works naturally within the body to calm and relax. The natural flavonoids in Passiflora are responsible for its ability to unfrazzle the mind and promote inner peace and relaxation without drugs or dependence. Rejuvenate your mind and body with this wonderful herb! Magnesium is the fourth most abundant mineral in your body, yet it's believed that substantial numbers of adults fail to get the recommended amounts of this crucial mineral. Also, certain prescription medications have been found to deplete the body of this mineral!